Konstantinos Poulas was born in 1970 in Athens. He studied biology at the University of Athens where he also completed his Ph.D. 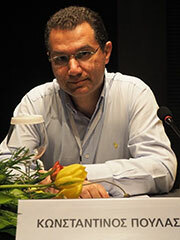 Since 2003, he has been faculty member of the Department of Pharmacy at the University of Patras. He has worked for 20 years in order to understand the structure and function of Nicotinic Acetylcholine Receptor(s) and its interaction with ligands, autoantibodies or monoclonal antibodies. He has developed two new methodologies for the crystallization of proteins, for one of which he is having an international patent. For the last four years he is studying and analyzing the e-liquids (before and after vaping) and also the effects of vaping at molecular, cellular and histological level. He has more than 70 publications in peer reviewed journals and he is currently participating in HORIZON2020 and national projects. He serves as Scientific Advisor of two biotechnological companies in Greece and co-founder of another two. He is currently offering services within the University of Patras for autoimmune diseases diagnosis and biochemical/chemical analysis, while he is the Director of BioHealth Hub, within Patras Science Park.